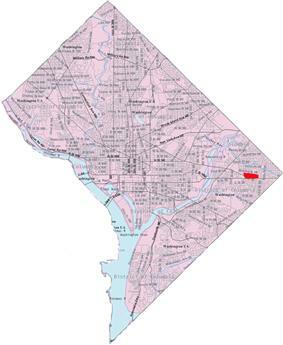 Benning Heights is a residential neighborhood located in southeast Washington, D.C. It is bounded by East Capitol Street to the south, Brooks Street NE to the north, 44th Street NE and Benning Road to the west, and Division Avenue NE to the east. It is served by the Benning Road station on the Blue Line of the Washington Metro. Politically, Benning Heights is in Ward 7.